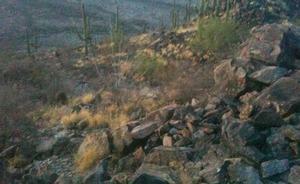 Rocks—of various sizes and composition—are among the most ubiquitous landscape feature in many of the areas where the Border Patrol operates. If the Border Patrol’s use of deadly force policy continues unaltered, agents can potentially excuse virtually any deadly shooting, anywhere, under any circumstance. On November 5, 2013 U.S. Border Patrol Chief Mike Fisher announced that the agency had rejected a series of policy recommendations by the Police Executive Research Forum (PERF) related to agents’ use of deadly force. The PERF, a non-profit organization that advises law enforcement agencies on best practices, had been commissioned by the Border Patrol, at the behest of Congress, to review its policies following at least 20 killings committed by agents since 2010. The Border Patrol has long claimed that the throwing of rocks or other items over the U.S.-Mexico border wall represents a potentially lethal threat against its agents. On this basis, the agency authorizes agents to shoot-to-kill the alleged rock-thrower. The Border Patrol maintains this position despite the fact that there is not a single known case of an agent being killed by a rock in the agency’s almost 90-year history. Since 2010, the Border Patrol has cited the throwing of rocks at least eight times to justify the killing of otherwise unarmed civilians. This has frequently involved agents shooting from a considerable distance, across the borderline, into Mexico. 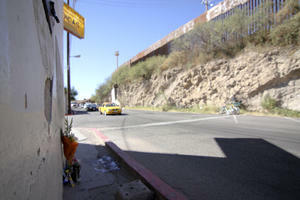 Exemplary of such shootings is the murder of José Antonio Elena Rodríguez, a 16-year-old resident of Nogales, Sonora, who was gunned down by Border Patrol agents on October 13, 2012 while walking from his home to his brother’s place of work. The Border Patrol claims that at the time of the shooting agents were under assault by rocks hurled over the border wall. This story contradicts every other available eyewitness account of the incident, and is belied by the fact that agents opened fire from atop a 25-foot embankment and behind the 16-foot high steel-columned border fence, safe from any reasonable likelihood of even a rock grazing. Although the entire incident took place immediately in front of multiple Border Patrol surveillance cameras, the agency has refused to release any footage—or even the names of the agents involved—repeating its argument that because rocks had been thrown over the border wall, agents were justified in killing this unarmed Mexican boy. On the surface it is difficult to understand the reason for maintaining such an excessive and disproportionate policy. In recent years it has come under considerable criticism, from groups like the ACLU and the Southern Border Communities Coalition, the editorial board of the Los Angeles Times, and the Department of Homeland Security’s own Office of Inspector General. Tragic shootings like the one involving Jose Antonio Elena Rodriguez have sparked outrage and protests in communities across the southwest borderlands. Yet the policy continues. Why? Other than Fisher’s brief statement on Nov. 5, the Border Patrol has remained circumspect about its reasoning, about the details of the PERF recommendations or those from an Inspector General report released in September. Nevertheless, to appreciate why the agency’s present guidelines are so insidious, it’s worth placing the policy in context. Although at first blush this may appear surprising or hyperbolic, a useful place to start is the now-infamous murder trial of George Zimmerman for the February 26, 2012 shooting of unarmed 17-year-old Trayvon Martin in Sanford, Florida. Much of the controversy surrounding the Trayvon Martin killing focused on the initial reluctance of police to arrest or interrogate Zimmerman, and prosecutors’ seemingly cavalier attitude toward Zimmerman’s predatory behavior. No less outrageous, of course, was the acquittal of Zimmerman on the basis of Florida’s “Stand Your Ground” law, a development that has prompted widespread calls to revisit and repeal such laws in the many states where they have been adopted. Yet Florida’s “Stand Your Ground” law still requires a finding that the use of deadly force by an assailant was necessary “to prevent death or great bodily harm to himself or another or to prevent the commission of a forcible felony.” How was Zimmerman, who initiated the encounter with Trayvon—who hunted Trayvon down, despite the young man’s efforts to escape—able to claim self-defense, e.g. that his life was in imminent danger? As geographer Jenna Loyd has written, “[f]rom opening to closing remarks, the defense relied on the logic that a young Black man, in the presence of the sidewalk, spelled danger to others.” By implication, there is virtually no place in the United States where a youth like Trayvon could be safe from deadly aggression—agression justified in the eyes of the law—by an individual like George Zimmerman. Almost identical claims to those of Zimmerman’s defense were raised in the most recent case when a Border Patrol agent was actually prosecuted for killing an unarmed civilian. On January 12, 2007 Border Patrol Agent Nicholas Corbett shot Francisco Javier Dominguez-Rivera from a foot away, execution style, as Dominguez-Rivera was trying to surrender to him. Multiple witnesses confirmed that Dominguez-Rivera posed no threat, and the evidence of negligent homicide or second-degree murder was sufficient to convince prosecutors to pursue multiple charges. Corbett’s defense rested on his claim that Dominguez-Rivera had picked up a rock and threatened to attack him—that Corbett, fearing for his life, properly followed the Border Patrol’s use of deadly force regulations by shooting Dominguez-Rivera in the back of the head. Rocks in the borderlands. Photo by Geoff Boyce. Corbett’s assertion was compelling enough to convince at least some jurors, resulting in a hung jury in two consecutive trials. Although not a full exoneration, Corbett ultimately walked free, delivering prosecutors an unambiguous message: think twice about bringing murder charges against a Border Patrol agent, even under the most egregious of circumstances, if and when the shooting takes place in the presence of rocks. Since the Corbett trial, prosecutors have declined to file charges in any subsequent agent-involved killing. This is the insidious logic of the Border Patrol’s present regulations on the use of deadly force. The question at stake is not only whether the throwing of rocks is proportionate to the lethal discharge of a firearm. In theory, agents have a number of alternative tools at their disposal in the face of what they believe to be a credible threat to their safety—to de-escalate, to withdraw to a safe distance, to employ less-lethal force like a pepper ball gun or taser. At stake in the controversy over the agency’s use of deadly force guidelines is whether these allow for de facto impunity in almost any agent-involved shooting. This is why Michael Fisher’s November 5 announcement is so outrageous to so many advocates and residents of the border region. Until these policies are reformed, all of us—particularly young Mexican or Mexican-American men who live or work near the border—will remain a lot less safe. Geoffrey Boyce is a PhD Candidate in the School of Geography and Development at the University of Arizona. He writes and blogs on homeland security and immigration-related issues, and can be reached at gboyce[at]email.arizona.edu.